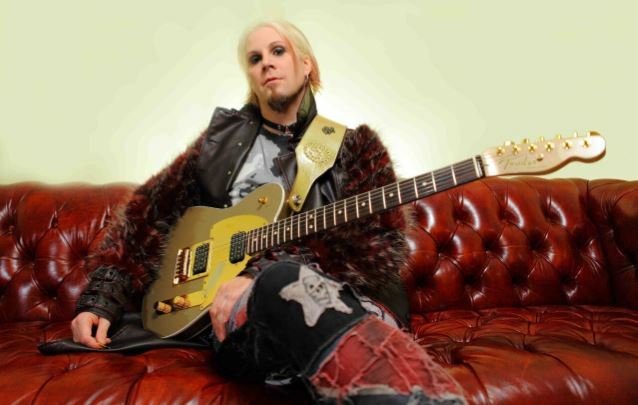 In a brand new interview with the "Talk Toomey" podcast, former MARILYN MANSON and current ROB ZOMBIE guitarist John 5 (real name: John William Lowery) took partial credit for reuniting Gene Simmons and Ace Frehley at the former KISS guitarist's February 3 concert in Beverly Hills, California, marking the first time the KISS legends were photographed together since their 2014 induction into the Rock And Roll Hall Of Fame. Asked how he came to be involved with Ace and Gene's reunion, John 5 said (hear audio below): "Gene is my buddy, just like Peter [Criss, original KISS drummer], Paul [Stanley, KISS frontman] and Ace. I e-mailed Gene and I said, 'Gene, hear me out. Let's go down the street from your house. Ace is playing right down the street. Let's go have some laughs, let's go watch Ace. I'll pick you up, we'll park right in front, we'll walk in, and we'll have a great time. 'Cause me and Gene, we get together and we laugh and we have a really good time. I mean, I love the guy — love the guy. Iv'e known him for years, and he's the funniest, best guy." He continued: "So I'm thinking he's gonna e-mail me back and go, 'I can't do that,' or, 'That's not a good idea,' or, 'I'm busy.' And he e-mails me back and he goes, 'Okay. Let's do it.' And I set it all up, made sure we had our parking right in front. And we walked in. And we were sitting in the room. Ace wasn't there yet. Ace walks in, and I'll tell you, man, those guys started talking like they have been… They didn't miss a beat. They were just talking like no time has passed. And they were talking about [the early days of KISS performing at] the Coventry [club in Queens, New York], and they were talking about the Daisy [club in Amityville, New York], and it was so cool. It was really cool. And I didn't say a word; I just listened. 'Cause these guys were talking and just talking and talking. And it was so great, and we all had a great night. Ace sounded amazing. Ace sounded great. And me and Gene were watching on the side of the stage and we had a blast. And we just all had… It was a night I'll never forget, and I'm so glad we did it." Asked if he thinks it's fair to say that much of the supposed bad blood between the original KISS members was manufactured by the press, John 5 said: "What I've experienced, and I'm very, very, very close to Peter… I'm close to all of 'em; I talk to all of 'em. They all love each other. They have such a history together. And I didn't see any — any, any, any — weirdness at all between Gene or Ace at all; they just seemed like two great friends that caught up and had a great night. So, yeah, I don't… That's just from my eyes. I don't see any drama or anything. But what do I know? I'm just someone on the outside looking in. But I just see four guys that have respect for each other and love each other." Rumors about Frehley's return to KISS gained strength last year after he teamed up with Stanley on a cover of FREE's "Fire And Water" in what was their first collaboration since 1998's "Psycho Circus". MEANWHILE ~ some guy name "Eugene" crashed Ace's VIP meet-n-greet last nite in Beverly Hills without rendering payment. If any of you Rock Soldiers can identify this man of mystery, let us know!